Entering his 43rd NAB (yes 43rd, that is NOT a typo!) who better to catch up with to give us some insight into the past and future of Polar, NAB and the industry in general. I caught up with him at the newly rebuilt offices of Polar Headquarters in Pinner, Middlesex. I was working for the Bank of New South Wales in London, I’d been there 5yrs and was fed up with the boring routine of international banking. My brother-in-law asked me to join him in a company called Éclair Debrie, in 1975. I was interested in cameras and the job was to sell 16 and 35mm film cameras. I won’t bore you with the long history of my days since then. In brief, I later joined Rank Film Equipment selling Film / TV lighting and assisting with Ariflex sales. Later I joined Keyline Productions who were the European distributors for Convergence Corporation (they designed the first joystick editor before non-linear). In 1979 I set up my own company ‘Polar Video’ (with Fred Smith). Polar Video closed its doors in 1990 and Fred and I went our own ways. 4yrs later I set up Polar Graphics, in a nut shell that’s it. There have been huge changes since I started. People coming into the industry accept everything for what it is. You pick up a computer with a software programme and start working. Many don’t know about gen lock, chroma phase or anything like that because it’s sorted out within the computer. The Film industry taught me about professional camera lenses, what to look out for, how to light sets and deal generally with problems on set. If you can resolve the initial problems on the shoot the work in post is made easier. I even worked as an assistant camera man for a while in 1970 on the original ‘Bouquet of Barbed Wire’ TV production. The move to Keyline Productions in the late 70’s was my first step into the Video business where electronic editing was just starting. At this time we were still using black and white monitors for preview and tape for recording. Most of the tape machines at that time (U-Matic) had no way of shuttling tape across the heads so we were pioneering in using servos to control and shuttle tape with an accuracy in the edit of plus or minus 4 frames. It was a great experimental time and I even had the opportunity to work on a very small bit of ‘The Shining’ where they experimented with Off Lining. The move later into proper computer technology for non-linear and graphics packages was a major step forward. You used to manufacture your own products at Polar Video, is that correct? Yes. We got somewhat fed up with our suppliers not producing the products we kept asking for so decided to design and build them ourselves. We built the first dual channel timebase corrector called ‘Roger’. A chromakey, a safearea generator, a vision mixer and many ancillary products and sold them all over the world. They were a very successful range of products. How did you decide on the name Polar Graphics? up Polar Graphics it was really a follow on from there, as most people already knew the name. Polar Graphics distributed a lot of computer packages like Boris Effects and Digieffects etc. so Polar Graphics seemed a good name at the time. Today though we are mainly hardware and storage orientated. Can you tell me more about what Polar Graphics and its associate companies do? Polar are known as an exclusive Distributor and/or Manufacturers Rep. In most cases we set up and maintain the European dealer channel for a small number of suppliers who are based in UK, USA, Taiwan and Australia. We generally work through resellers but with one or two of the products because of the intricate nature, we do deal direct with end users (especially in the Broadcast end of the market). Polar Graphics and my associated companies (Bluefish444 Europe and Dark Matter Technologies) are the distributors/representatives for Apantac, Bluefish444, Cinedeck, FocalPoint Server, Mediaproxy, Stardom, StorageDNA and StudioNetworkSolutions. Where do you see the industry going & do you see any big changes going forward? The buzz word today day is IP, with new products coming to market, everyday, incorporating IP technology, but the issue is about having a unified industry standard, so everything can be connected together. The cloud is here, with many companies either using third party cloud providers, having their own ‘private cloud’ or using a hybrid cloud model. Our compliance monitoring product supplier already has customers monitoring within ‘cloud’ playout facilities. Another new development from StorageDNA is the use of random access LTO/LTFS tape. With transfer rates (read & write) comparable to disk storage, tape becomes a cost effective viable alternative to disk storage for some workflows, e.g. DIT, conform, ingest/import etc. As more and more data is being produced, the demand for SAN/NAS solutions is increasing and keeping track of this data is crucial. Hence the increased need for a simple Asset Management system, which can track the workflows, versioning etc., and that doesn’t ‘consume’ everybody’s day. Broadcasters in South Korea are already broadcasting in 4K and other countries will follow suit so the need for capture devices to handle high data rates, 4K60p and above, is vital. 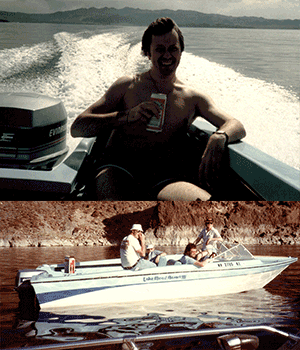 What happened on the speed boat on Lake Mead? Those were good old days but probably best left alone during this interview. We were young and reckless. Suffice to say that a group of us from the industry (including some veterans still around today and some who unfortunately are no longer with us) took a number speed boats out during NAB and had a smashing time.